Print 49 from “Pictures of Famous Places in the Sixty-Odd Provinces”. Until the end of the feudal period in 1868, the country was divided into eight regions and 68 provinces, with all the land belonging to the state and merely “on loan” to the feudal lords. The Kannon Temple of Abuto was built on the steep, picturesque banks of the Inland Sea in the 12th century. 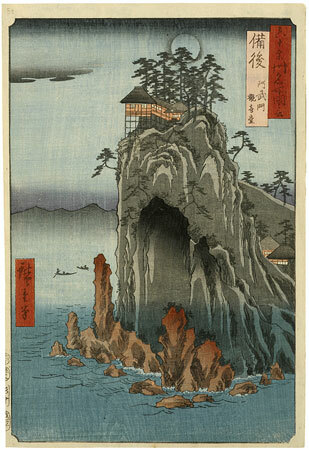 Recently it was discovered that Hiroshige used an illustrated travel guide for his designs. However, the beauty of this print, which is bathed in magically shimmering moonlight, far exceeds that of the simple black and white illustration. Recent studies have shown that Hiroshige borrowed his design for this print directly from a printed guide book. Nevertheless, the beauty of this print, and the effect of moonlight, are as far from the original outline design, as some Harunobu colour prints are from their original black-and-white book illustrations by Sukenobu and others. This impression bears all the marks that Stewart describes as “best”: the water is green, blue at the edges of the rocks, the distant mountains are black at the top, the cliff is dark grey with overprinting and the nearer rocks at the base are reddish-brown. Another impression, without the band of cloud in the upper left corner is reproduced in Stewart’s Subjects Portrayed in Japanese Prints, pl. 26.